n 1313 Stirling Castle was being held by the English under the command of Sir Philip Mowbray. A Scottish army under the control of Edward Bruce, the brother of Robert Bruce King of Scotland, laid siege to the castle. On midsummer's day of 1313 Edward Bruce and Mowbray came to an agreement. It was agreed that if an English army had not come within three leagues of the castle by midsummer's day of 1314 Mowbray would surrender the castle to the Scots. Edward Bruce allowed Mowbray to leave the castle so that he could inform Edward II, King of England, of the terms of the agreement in person. 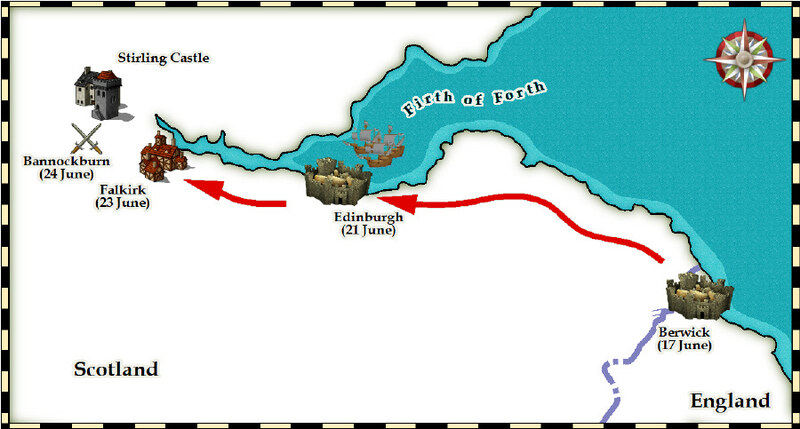 The English army left Berwick on the 17th of June, 1314 and by the 21st had reached Edinburgh. Supplies were taken from their ships there1. 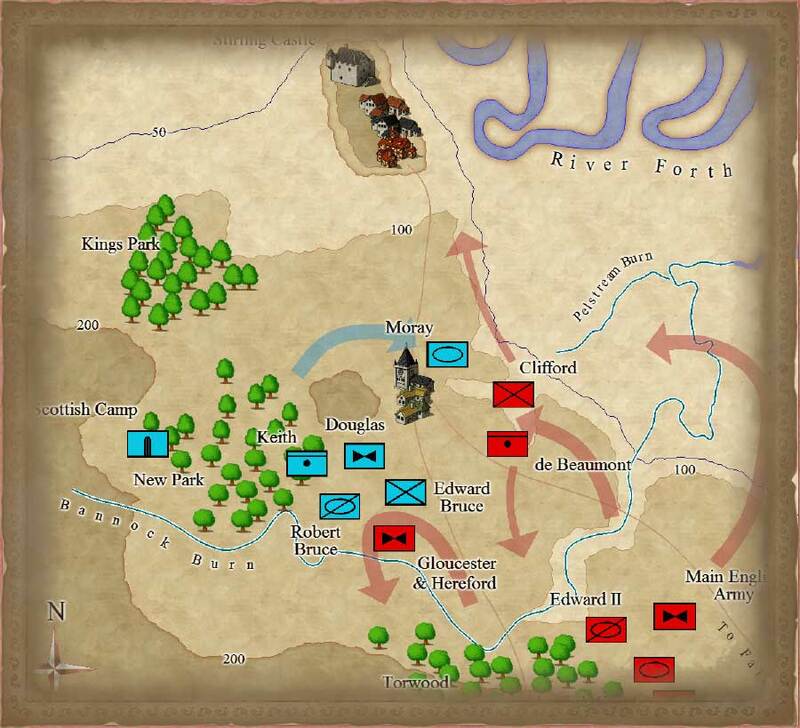 Time was running short and so on the 22nd of June the army marched towards Falkirk and reached it by the evening. 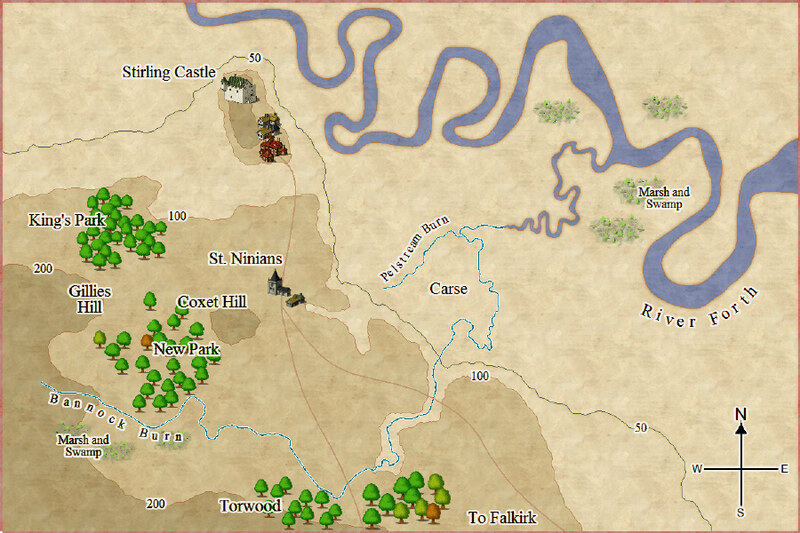 The English army left Falkirk on the morning of the 23rd and marched up the Roman road towards Stirling. Ahead of the English was the Torwoord, an ancient forest, and beyond that the Bannock Burn and its tributary the Pelstream, streams that feed into the River Forth. Beyond the Bannock Burn to the west of the road was another forest called New Park which was on high ground. Alexander III had this forest fenced in 1264 to be used for hunting. This forest is separate from the older King's forest to the north near the Castle. To the east of the road was an area called the Carse. The Carse was an area of marshy land with many small streams. This area was to have an important affect on the outcome of the battle.